Joanne Rowling, OBE, FRSL (/?ro?l? 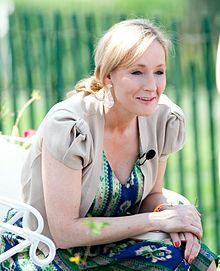 ?/; born 31 July 1965), pen names J. K. Rowling and Robert Galbraith, is a British novelist, screenwriter and film producer best known as the author of the Harry Potter fantasy series. The books have gained worldwide attention, won multiple awards, and sold more than 400 million copies. They have become the best-selling book series in history and been the basis for a series of films over which Rowling had overall approval on the scripts and maintained creative control by serving as a producer on the final instalment. I do get recognized, but I must say Edinburgh is a fantastic city to live if you're well-known. There is an innate respect for privacy in Edinburgh people, and I also think they're used to seeing me walking around, so I don't think I'm a very big deal. I'm interested in that drive, that rush to judgment, that is so prevalent in our society. We all know that pleasurable rush that comes from condemning, and in the short term it's quite a satisfying thing to do, isn't it?